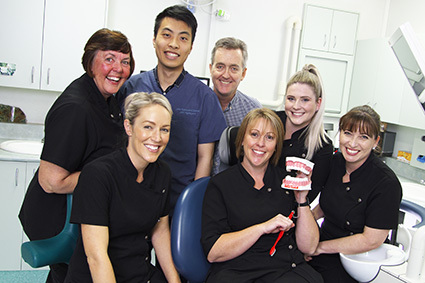 Dr John Appleyard has been operating as a dentist for over 30 years now and began John Appleyard Dental back in 1998. Situated in the heart of Albury on Swift Street, our practice is easily accessible to all members of the public, whether traveling by car or public transport. You’ll find us nestled among some of Albury’s most iconic locations, including the Albury Entertainment Centre, Albury Library and Murray Art Museum Albury. 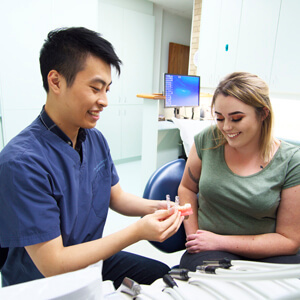 Since 1998, our practice has grown to include Dr Tony Tao (Dentist) and Jackie Edmunds (an Oral Health Therapist with an Advanced Diploma in Adult Dental Therapy). Our team members are highly experienced and trained within multiple facets of dentistry and their passion for providing the highest quality of dental care is second to none. Our goal is simple: to provide the highest quality of professional care in a warm and friendly environment. Not only do we offer the same wide range that general dental practitioners provide, but our team members’ advanced training and qualifications in a number of areas of dentistry (including oral surgery and implantology) allows us to also offer additional services in-house. We don’t believe in rushing our patients during appointments, nor do we ever want our patients to feel as though their questions are going unanswered. As a result, we allow for longer consultation times to ensure every need of the patient is being met – whether that’s carefully explaining treatment, appropriately addressing their queries, listening to their wants / needs, and simply taking the time to thoroughly assess their condition. That’s the John Appleyard Dental difference. We also understand that for some, visiting the dentist may be a stress-inducing experience. This is why we offer additional services including the ability to work under general anaesthesia at the nearby hospital if required. Additionally, our team members believe in treating every patient with respect and we take the time to build a relationship built on trust and understanding. If you ever start to feel anxious or uncomfortable during treatment, you only need to bring it to our attention and we will go above and beyond to ensure you feel comfortable and at ease.